As the above comments suggest, writers don’t always say what they mean—and mean what they say. Nor should they. And those who do say exactly what they mean often wreak havoc with their career and/or business relationships. Others, paralyzed by fear and inadequate writing skills, struggle simply to get any words on paper at all. Yet business writers know that their company places a premium on their ability to write clearly, concisely, accurately, quickly, and at times persuasively and diplomatically. In addition to time and money, consider the personal and company image conveyed by someone’s writing style. Whether a valid judgment or not, many readers will evaluate your job expertise by the memos, emails, proposals, and reports leaving your desk. Your written word is documentation of your promotability. 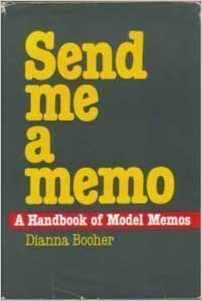 This handbook of 161 sample memos (or emails, if you wish) in 66 alphabetically arranged categories that cover every conceivable business situation. It includes sensitive topics such as complaints, dismissals, raise requests, directives, and expressions of sympathy. Send Me a Memo is invaluable for everyone who must write—from the CEO to the newest trainee. ©Copyright, Booher Research Institute, Inc.